1: Yeading FC were formed in 1960. However they did not start playing senior football until 1984 when they joined the London Spartan League. 2: They were an immediate hit in the Spartan League, winning promotion as runners up of the Senior League, winning promotion to the Premier Division. The following year they were runners up of the higher league, winning the Championship in 1987. 3: Following their league win in 87, they made the step up to Isthmian League football, stating in Division 2 South, a league they won in 1990. They stepped up to their new level with aplomb, finishing 3rd in their first season. A runners up spot behind Stevenage was enough to see them promoted to the Isthmian Premier. A record 5th placed finish was achieved in 1996/97 which remains their highest finish in the non-league pyramid to date. Despite this they were relagated back to Division 1 the following season. 4: Though it took until 2003/04 to get back up, they were back to back champions and found the last 2 seasons of their existence in the Conference South, finishing 16th on both occasions. 5: The clubs' best run in the FA Cup came in the 2004/05 season. Though they had a bit of luck by not drawing a league side until the 3rd Round, they did themselves proud. Drawing Newcastle United they had the game moved to QPR's Loftus Road, coming away from the game with a credible 2-0 loss. 6: Their best run in the FA Trophy came in their last season of existence. They reached the 3rd Round before a defeat to Grays Athletic who had won the competition for the previous 2 years. 7: In the FA Vase they were winners in 1990, defeating Bridlington Town 1-0 at Leeds United's Ellland Road. The game was a replay after the original tie had ended 0-0 at Wembley. 8: The most famous player to pull on the Yeading shirt was DJ Campbell who scored an impressive 83 goals in 109 appearances. However due to not being on a contract, the club only recieved a nominal fee when he moved to local league side Brentford in June 2005. 10: The club left the ground in 2007 when they merged with Hayes to become Hayes and Yeading United. However the ground was still used for youth and reserve games for a few years after that. My first and only visit to The Warren was in April 1995. My Dad was into going to see random games and I was happy to go along, especially as I had nothing else on. Wycombe were away at AFC Bournemouth that day and lost 2-0. At the game I went to, Yeading beat Purfleet 1-0 with a goal from Johnson Hippolyte, who would go on to be the manager of Maidenhead United amongst others. 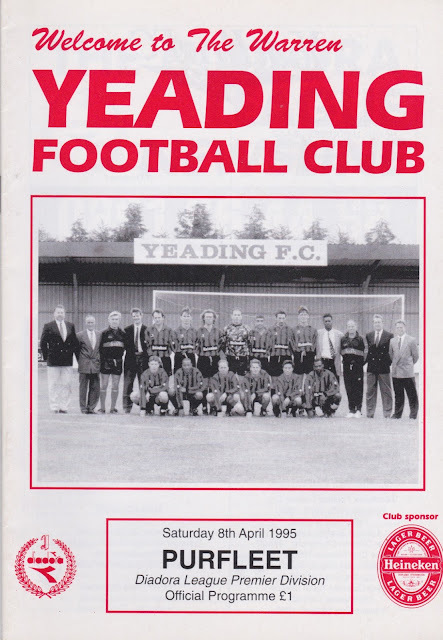 It wasn't a brilliant game, from what I remember, Yeading deserved their win. 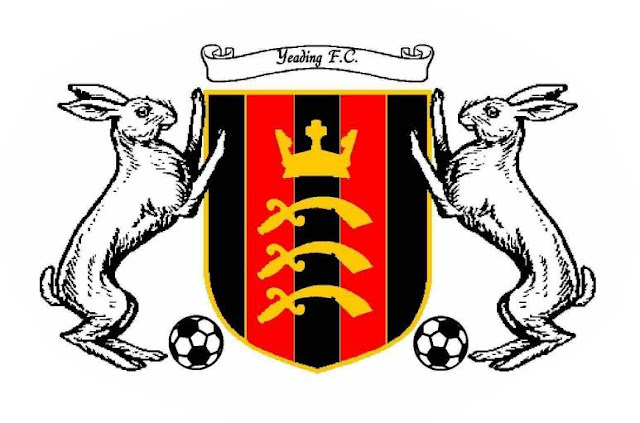 Yeading would eventually be absorbed into the new club Hayes & Yeading with the merger seeing very few of the limited Yeading support make their way to the new club - initially at Hayes FC's Church Road. As for Purfleet, they changed their name and are known as Thurrock and are currently playing in the Blue Square South League. They finished in a relegation spot last season but were saved by the knock on effect of Rushden & Diamonds going bust. THE WARREN was a tidy and compact ground, though not particular spectacular. A low 100 seater stand provided the only seated accommodation, although this was later expanded to 250 seats to comply with new ground grading rules. There was also an area of covered terracing while the rest of the ground was open with an overall capacity of 3500 upon closure. The below pictures are taken in June 2005 on a non-matchday as I was in the area and didn't get pictures on my original visit. As for other facilities, the club shop was a big disappointment, in the fact that there wasn't one which was a shame with the excellent one on offer at Hayes, just down the road. I remember the tea bar being good value, but on my only matchday visit I was too young to use the bar. The site is currently being redeveloped as use for a new Stadium for Hayes and Yeading, who merged in 2007. As well as a football ground, there are plans for 3G pitches and other community facilities. After many delays the new ground is set to be used for the first time in a friendly in late July 2016.